It's one thing knowing how to play the harmonic minor scale (e.g. its patterns), but knowing when to use it is where a lot of guitarists struggle. It can be an awkward one. In this lesson I'll reveal five situations in which harmonic minor can play an effective role in your solos, in both minor and major keys. The focus here will be on training your ear to identify the chord changes that imply harmonic minor. That way, you'll know exactly when to make the "scale switch", simply by hearing the chord progression. Knowing when to change scales is a hell of a lot easier when you know what to listen out for. In terms of soloing and creating a melody over a sequence of chords, that's where ear training can be hugely rewarding. In fact, it can get to the stage where you hear a song for the very first time and can actually predict which chords (and therefore scales) will come next, based on the implied harmony. As you can imagine, this does wonders for your improvisation skills. As mentioned in the video, the most common application of harmonic minor in minor keys is over the major V (5) chord. Tip: Over the V chord, the emphasis is on harmonic minor's major 7th tone (7), because this becomes the major 3rd of the V chord - a strong target note for harmonization. This is the defining note in the switch from natural to harmonic minor. Note: If the chord progression only moves back and forth between the i and V chords like this (as some songs do), you can technically use any minor scale (e.g. Dorian, natural/harmonic/melodic minor) over the tonic chord. However, we're specifically looking at the most commonly used minor key centre - natural minor. So if any other chords are used away from that V chord, natural minor will be your safest bet. Here, I play natural minor over the opening three chords - i VII VI - and then switch to harmonic minor over the V7 chord. Click the tabs in this lesson to hear examples. Using harmonic minor over the V chord in major keys makes a nice change from the more natural sounding major scale. In fact, this application goes back to the baroque, classical and romantic periods. You won't always want the tense sound it offers, but keep it in mind for when you want to add some variation to your major key solos. Tip: Just like with the minor key V chord, the emphasis is on harmonic minor's major 7th tone (7), because this becomes the major 3rd of of the V chord. Playing C major over a I IV ii V progression, with C harmonic minor played over the V chord. Harmonic minor can work nicely over the major III (mediant) chord in major key progressions. You could use the same "relative root" method as before if you like - for example if the progression moved from Cmaj to E7 (I to III) you might play C major over Cmaj and then A harmonic minor (A being relative to C) over E7. However, as covered in the video, if you want to keep the same root as the major scale, use harmonic minor's 3rd mode - major/Ionian #5. This might seem confusing to you, but all you really need to know is that using this major #5 scale over the III chord will ensure you don't hit a bum note (since the major III technically moves us outside the major scale). Note that this won't work over a natural iii (minor) chord in major keys. You need to train your ear to hear this major/minor mediant distinction. That's what the audio below is for! Tip: try targeting (or emphasising) the #5 of major #5 over the III chord, as this corresponds to the chord's major 3rd - a strong note for harmonization. 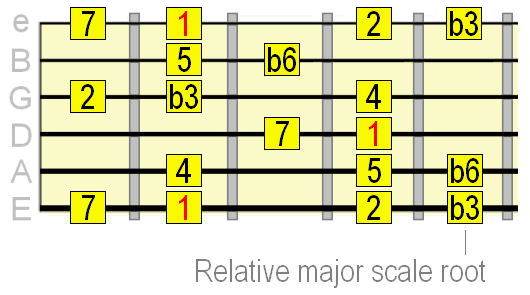 Towards the end of the example I use a major pentatonic pattern (instead of straight C major) which would, as it happens, overlap with the relative harmonic minor pattern. Always be looking for these convenient positions when switching scales. Of course, you can also use harmonic minor to colour minor chords on their own. However, most commonly it works best over the tonic (i) chord in minor key progressions, as a spicier alternative to natural minor. Use the i - V tracks from earlier to experiment with this. Using the major 7th of the scale over a minor chord will give it a very tense sound, and sometimes this is desirable. Just be aware of the colour it adds to your minor chords and use it appropriately, based on the sound you want. Hopefully, after going through this lesson, you'll see (well, hear!) just how valuable ear training is. If you want to take this to the next level, I highly recommend the free 10 day course from Easy Ear Training. These guys will show you how simple ear training exercises can make you a better musician, which translates into better guitar playing!